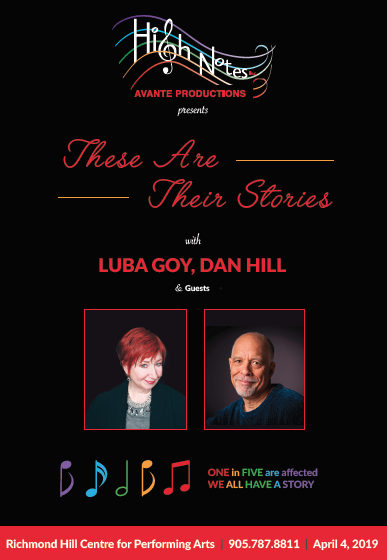 April 4, 2019 Dan Hill will headline the mini gala performance at the Richmond Hill Centre for Performing Arts. Also with Luba Goy, Erika Nielsen…and more! The main social event of the spring of 2019 for us. YOU DON’T WANT TO MISS this inspiring and heart-warming event. Join us for an evening of stories, music and laughter. We will celebrate success, remove stigma, give hope and save lives. Call the box office at 905.787.8811 for tickets or get them HERE NOW. We are presenting these concerts/events thanks to small municipal grants from the Town of Richmond Hill and the City of Markham. Please consider supporting us with a donation as well. WE are also thankful to RBC, to ResetZone, to Brainstorm Revolution and to Janine Purves of Assante Wealth Management for their sponsorship. Thanks to Ken Alexander and Snapd for the photography and to 105.9 The Region and ZoomerRadio for helping us promote the event.